If you know anyone who climbs, you know they have a specific body type: lean, muscled, taut. Maybe you want that type of body but don’t necessarily want to experience the dangers with climbing. The good news? There’s a machine you can use in your home that offers all of the reward and none of the risk. Let’s talk about the best vertical climbers. If you’re embarking on a weight loss journey and want to see results quickly, the MaxiClimber is for you. If you weigh more than 200 pounds, you might consider this option. The Merax can accommodate users weighing up to 350 pounds because of its sturdy construction. The Weslo is for you if you want a vertical climber that’s both reasonably priced and high quality. Designed for the fitness enthusiast looking for a high-quality machine at a reasonable price that can fit in most home spaces. 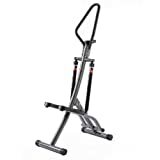 The Conquer is the best choice of vertical climber for a light and consistent cardio workout. If you’re looking to push through plateaus, this machine will allow you to keep pushing due to its wide range of resistance settings. 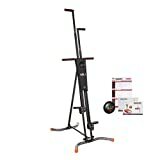 The MaxiClimber is simple to assemble, folds up easily, and comes with technology that helps you track your workouts and meals on your smartphone. 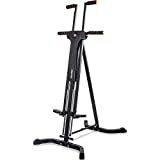 This vertical climber is a high-quality machine with a solid design and comes with useful features like an LCD screen and non-stick pedals. The climber makes workouts comfortable while featuring a shelf for a phone. You can also adjust the resistance for upper and lower body exercises separately. The frame and legs are sturdy, well built, and still lightweight enough to move around if necessary. The main frame of the climber is lightweight, portable, and easy-to-assemble and comes with a reasonable price tag. The frame is slim, lightweight, and a space saver. It also has a wide range of resistance settings, which allows you to customize your workout. The MaxiClimber doesn't offer the highest quality frame you can find on the market. Since it is built for stability, the frame can be difficult to assemble and move around when necessary. There’s only one resistance setting, so if you’re interested in pushing through plateaus, this may not be the machine for you. There are no resistance settings, meaning you can still get an intense workout, but you just can’t push yourself harder as you progress. The Conquer lacks dedicated resistance settings, making it more difficult to control the difficulty of your workout. This model requires some maintenance and oiling after several months to keep it working smoothly. Get a complete workout. Unlike other exercise equipment, a vertical climber engages nearly every part of the body, including upper and lower muscles. Instead of focusing on just a few different muscles each exercise, you get the benefit of toning multiple muscle groups in a shorter amount of time. Burn calories fast. Exercising on a vertical climber isn’t just good for the muscles. Some exercises will get your heart and lungs in on the action as well. Focusing on a medium-to-high pace, for example, will help speed up the body’s metabolism. Protect the joints. Most workouts aren’t too friendly on the joints. Running and weightlifting can cause harmful stress on the elbows and knees, in particular. With a vertical climber, you are suspended, so there is very little impact. Exercise anytime you want. It should go without saying, but climbing outdoors has its challenges. Unless you want to dress for the extremes Mother Nature can produce, you will likely be at the whim of the weather. Exercising indoors, however, puts a roof over your head, so you can climb anytime you feel like. These are the most popular and basic vertical climbers available. Using a single frame, they use pegs at the top for your hands and pedals on the bottom for your feet. Together, the arms push and pull while the feet step for a complete workout that works the muscles and the cardiovascular system. Similar to the traditional design, transitional climbers are mainly different at the top. Instead of pegs, these climbers use ropes and pulleys to work the arms. As a result, it’s easier to spot train the arms individually without having to engage the whole body if you don’t want, expanding the number of workouts you can do. Based out of Los Angeles, California, this company knows a thing or two about good fitness equipment. Well-known for many different types of gear, Sunny Health & Fitness’ catalog is filled with great treadmills, ellipticals, rowers, bikes, and more. On the vertical climber side, check out the Sunny Folding Climbing Stepper. A dedicated manufacturer of affordable workout equipment like treadmills and exercise bikes, Welso offers a lot of value for a small price tag. Check out the Stepfit and Basic vertical climbers for good, budget-friendly options. This company likes to split the difference between exercise equipment and non-sport products like desks. Within the Conquer Sports lineup, you will find some great gear like the Cardio Machine 3.0 Climber. $100 and below: The best price range to check out for budget climbers. Most options will be basic, but a few do come with extra accessories or an LCD panel. $100-$300: A good price range for higher-quality climbers with more features and accessories. Bulkier frames, padded handles, and LCD panels are more common here. $300 and above: Save for a few high-end home climbers, most options in this range will be commercial climbers meant for gym use. These are often quite an investment. Since you aren’t sitting on a vertical climber, the main things that will influence the overall comfort are the handles and pedals of the machine. Both need to be large enough to support the size of your hands and feet. Padding on the handles is also a good addition to create an ergonomic grip that won’t tire out your hands as you exercise. Many climber machines have easy-to-read LCD displays that keep you updated on the distance you’ve climbed, how many calories you’ve burned, and how much time you’ve spent working out. Tracking your workout metrics helps you achieve your fitness goals. Some vertical climbers also come with companion apps for a smartphone or tablet to track progress. The best machines adjust in several ways to maximize comfort and fit. The handles and pedals should be adjustable to accommodate your height. Some machines also have adjustable resistance levels, but this is somewhat rare with most budget options. Weight limits: The structure of the climbing machine is long and lean. This kind of build doesn’t support every weight. Most machines have a weight limit of around 250 or 350 pounds. Comfort: The climbing machine should be ergonomic, designed for maximum productivity as well as optimal comfort. Some come with features that enhance this experience. If you want to spend a little more, you can get a machine with padded grips that can help prevent blisters. Some machines also have foot pads for added traction to reduce the possibility of slipping. Quality: The quality of a machine’s build will affect the quality of your workout. Construction and materials will dictate whether the experience is smooth or whether the machine sticks and jerks. If you’re willing to spend a little more, your machine will most likely offer a better experience. The MaxiClimber is the perfect machine to store in your home. It’s designed to take up as little space as possible—about three square feet—and to fold up easily for simple storage. This model also adjusts to fit different heights and weights but has only one resistance setting. A useful and motivating feature is the accompanying fitness app which gives you a range of high-intensity interval routines to choose. The app also offers a meal plan, complete with recipes, and allows you to track your fitness progress. Though the MaxiClimber is one of the easiest products to purchase and use, it’s less durable than some of the other climbers on the market. If you’re planning to use your climbing machine daily, you should consider a product with a sturdier build. The Merax Vertical Climber is a high-quality machine with a durable design. The sturdy build, which features square steel tubing, supports a higher weight limit than many other vertical climbers. The Merax can support weights up to 350 pounds safely. You can also adjust the climber to match your height for the perfect fit. Despite the robustness of this machine, its assembly is relatively easy and involves just a handful of bolts. The Merax is best for larger, taller users since the frame may be too large for smaller body types. If you’re on the smaller side, you may have some difficulty moving the machine around and reaching the handles. The Conquer 3.0 is built for comfort. It has a stable base with durable steel that feels sturdier than many competitors. With hand grips and adjustable handles, it’s a machine you can customize until it feels right. It’s also quieter than other machines. The Conquer improves upon the previous versions of this climber in several important ways: it’s easier to assemble and maintain, and it’s both lighter and more durable. The climber uses a sturdy chain and sprocket—a system which can support greater weight. The 3.0 is less likely to squeak or wobble than other machines. The Conquer lacks an electronic timer and adjustable resistance since it uses your own weight. The sliding parts have also been known to stick at times. The frame may not be as easy to store and move around as other products, but it’s built to last and is reasonably priced. Dimensions: 25.13L x 37.88W x 90.5H in. The Weslo Stepfit Climber offers the best value for the money. A high-quality product for a reasonable price, the machine has a range of features that make your workout convenient and comfortable. Among them is a shelf for a smartphone. The design is sturdy, so the machine is less likely to wobble. You can adjust the resistance for upper and lower workouts separately to isolate muscle groups and alternate arm and leg exercises using the same piece of equipment. Although the handlebars are adjustable, you may find it challenging to reach the grips if you are on the shorter side. The climber is also not the easiest model to assemble for the first time. The Conquer Vertical Climber is simply a steal. It’s sturdy and well-built with durable construction and a wide base. It also comes with time and calorie trackers, along with a free battery, and adjustable handles. The climber is good if you prefer lighter, more consistent workouts over longer periods like a week. The frame is durable enough to take more abusive exercises, but the climber excels at quick exercises to get the heart and lungs going. One of the biggest complaints with this model is the machine’s lack of resistance settings. This won’t stop you from getting an intense, calorie-shredding workout; it just means that you can’t push yourself harder as you progress. This climber is slim and lightweight, folds up, and fits into small spaces, so it won’t take up much space in your home. Its small footprint doesn’t come with a lack of sturdiness, though; the Sunny is solid. One great feature is the wide range of resistance settings, a unique bonus for a climbing machine. Each piston-cylinder can be set to a different resistance level, which allows you to customize your workout and adjust the intensity level of each muscle group during a workout. Despite all of the great features and the high-quality construction, this machine requires more maintenance than other options. This maintenance will keep the machine running smoothly, but it can be a time-consuming task to repeat if you want a machine you can forget about when not in use. This is the climber to choose when you want an alternative budget pick that doubles as a portable option as well. Using square steel tubing, the climber manages to offer a good balance of durability and portability that is useful in small spaces like apartments. Given its folding design, the frame is easy to set up without a lot of assemblies. The track offers plenty of extension for the average person and a smooth glide, so you can get the maximum benefit with most exercises. The simple, straightforward setup makes this one extremely user-friendly as well. Despite the heavy-duty construction, there are a couple of flaws with the frame. The track lacks any kind of stopping mechanism for the pedals, meaning it is easy to slam against the bottom during a full stroke. The limited warranty also leaves a lot to be desired in terms of future support from the company. Add foot straps to the pedals of your climbing machine to make yourself secure and comfortable as you work out. Instead of focusing on keeping your feet in their holds, you can channel your energy into your legs. Choosing a model with adjustable resistance settings isn’t the only way to increase the intensity of your workout. You can also wear a weighted vest. These cost as little as $20. If you choose a lower-budget vertical climber, you can still use a timer to track how long you exercise and determine the number of calories you burn. Q: How many calories can you burn on a vertical climber? A: A 200-pound person can burn more than 850 calories in an hour-long session on the vertical climbing machine—a burn rate similar to other high-intensity workouts like weightlifting or cross-country skiing. Q: Are vertical climbers safe? A: As long as you use the machine correctly, most vertical climbers are very safe and stable. Use a flat, hard surface whenever possible. As you work out, don’t overdo any exercises if you feel any strain or pain. Q: How much space is required to fit a vertical climber in my house? 1. Vertical climbers have a very small footprint, even when unfolded. Four to eight square feet is usually plenty of space for most climbers. If space is limited, use a folding climber to keep out of the way when not in use. Q: Do I need a climber with an LCD panel? A: Not at all. While an LCD panel is nice for keeping track of stats like the distance, it doesn’t improve the overall exercise much. Vertical climbers are great machines to have at home if you’re looking to tone your whole body and shred calories. These machines are also easy to assemble and store, and they don’t take up much space. Our top recommendation is the MaxiClimber since it’s compact, sturdy, and comes with technology that can help you focus and track your workouts. If you’re looking for a quality climber on a budget, we recommend the Weslo, which is designed for both stability and comfort. Which climbing machine is your favorite? Let us know in the comments below!